The impact of peer-to-peer fundraising comes from empowering your supporters to appeal to their own network. To show you what it’s like for a nonprofit supporter to run their own fundraising campaign, we imagined how one of them might experience it. It was two weeks before my birthday and I wanted to do something different. I was planning to have dinner with a few people, but I wanted to share the occasion with all my friends and family. Recently I’d found out about a local nonprofit called Music for Kids. They bring free music lessons into classrooms and after school programs. I’ve loved music all my life and I have a lot of great memories from being in my high school marching band. I was poking around Music for Kids’ website and they had pictures of a couple people who were fundraising for the organization. One of them was this guy fundraising for his birthday. It was perfect! I clicked the button to start my own campaign. Setting it up was actually pretty easy; I could register by just connecting my Facebook account. My page already had Music for Kids’ colors, logo, and a banner picture. 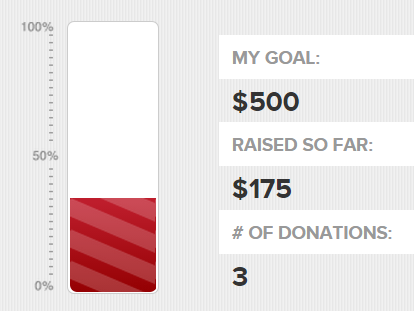 I just had to add my name, picture, and fundraising goal. The default goal was $500. It seemed like a lot, but I started thinking about how much I spend on other friends’ birthdays and thought, “Maybe my friends really could help me reach $500.” In just a couple of minutes, I had my own fundraising page. The next day I got an email from Music for Kids. They were writing to give me some tips and help me get started. They thanked me for making my page and gave me some first steps. Music for Kids had filled in some information on the fundraising page, but the email said it would really help if I told my own story on my page. I added a couple of sentences about how much music has meant to me growing up. I was nervous about asking people for money, but Music for Kids sent me an email template and said to start with close friends and family. After I sent out my first email, my brother, parents, and grandpa made donations. Grandpa even called to say how proud he was that I was using my birthday to help others. It felt really good to see the progress bar on my page go up. Now that I had a few donations, I shared my campaign on social media. I only really use Twitter and Facebook, but I’m friends with a couple hundred people on each network. Only a couple of my friends donated over the next two days, but every time someone gave, it was really exciting. The best part was when my friends donated, it showed up on my fundraising page’s activity wall and Music for Kids commented. It was really cool to know that the organization had noticed my campaign. That weekend I went to a concert and tried to catch up on some work that had been piling up. To be honest, I didn’t really pay attention to my campaign for a few days. Then, three days before my birthday, I got another email from Music for Kids. I was worried they’d guilt trip me for not having met my goal yet, but instead they congratulated and thanked me. They told me I was already making a difference. They ended the email with a couple of tips to help me make it to the finish line. It made me feel like the organization was rooting for me every step of the way. The email suggested asking coworkers or a church group, so I sent an email around my office to tell them about my campaign. Two of my coworkers made donations. I posted again to social media, too. Asking people to share my campaign helped out a ton. Five people posted it on their own Facebook pages, and I got a few donations from people I don’t even know. The day before my birthday, I got a donation from a guy named Nick. His Facebook picture looked familiar and when I commented on his donation to thank him, I asked him if he had gone to my high school. Turns out we had been in band together. He said reading about how much music meant to me reminded him of all the fun we had, and he wanted to pass it on. My campaign ended at midnight on my birthday, and I ended up raising $481. Sure, I didn’t hit my goal exactly, but for someone who never fundraised before, it felt awesome to raise that much money. I couldn’t have given that much on my own. I’m definitely fundraising again next year! To find out how much your nonprofit can do with peer-to-peer fundraising, try our interactive fundraising calculator!